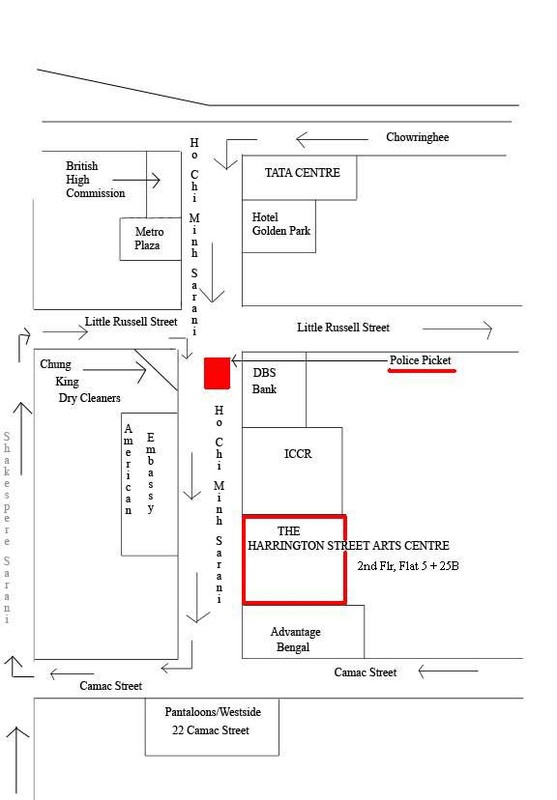 For your hassle free ingress and egress to our Arts Centre, we inform you that The Harrington Street Arts Centre at 8, Ho Chi Minh Sarani is situated opposite the American Consulate, next to ICCR. We are open 2:00 p.m. - 8:00 p.m. Your entry would be from Tata Centre into Ho Chi Minh Sarani or the crossing of Ho Chi Minh Sarani and Little Russell Street. If you mention ART CENTRE or ICCR or NUMBER 8 at the Police Check post, your vehicle will be allowed in smoothly. Should you wish to walk in, there is absolutely no bar to your movement. Our Valets will provide you secure, trouble free parking at the main gate of our Arts Centre.